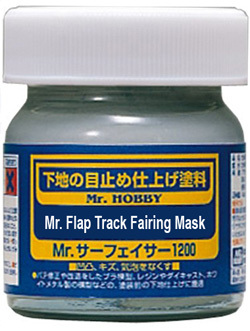 AIRLINERCAFE.COM - Forums - How do you mask flap track fairings? Forums / 1.0 Airliner Modeling / Airliner Modeling Chat / How do you mask flap track fairings? Seems like most airliner kits have the Flap track fairings molded as part of the wing.... This makes it hard to paint the under side of the wing if there is any coroguard or different color in the center part of the wing. I've tried painting the corguard first then masking it and then painting the fairing... I've tried painting the fairing first then masking it to then paint the coroguard... I've used masking fluid. I've tried tape of about 1,000 different types... Nothing I've tried gives a very pleasing result--especially on their leading edge. Has anyone come up with a method of painting/masking these fairings that produces a quality result? 1. Mask the flap fairings to paint the coroguard. Using vinyl tape for curves, completely covering/sealing the fairings, then paint the coroguard. After the paint cures and you're satisfied its ready to handle, mask the coroguard, and paint the fairings. Remember to get the tape off as soon as possible to prevent sticky residue. The residue can be removed using hot soapy water or isopropyl alcohol and a very clean cotton cloth with minimal pressure. 2. Reverse #1; mask the coroguard and paint the fairings first. Then, mask the coroguard to paint the fairings. 3. Paint the coroguard surfaces and the flap fairings without masking, allow to cure, then apply a coroguard decal with the slots cut for the fairings. Be careful...the decals may tend to wrinkle or tear along the slots. You may need to apply a solution to make them more pliable and toughen them up a bit. Just takes practice to build your level of confidence in your skill. You'll get it right! Happy modeling! Joking and workarounds aside, my favored approach for things like this is to paint on masking fluid, and then before it fully dries, use a hobby knife at a 45-degree angle around the font of it, and once it's fully dry, remove the section you don't need. The bonus with this approach is that you can redo it if you mess it up. I'm currently working on an American 767 so that's where my most recent bout of frustration originated. I painted the Boeing Gray on the wings and then tried to mask the fairings to then paint the coroguard. I usually prefer to do paint the coroguard second as I feel it makes it a little easier to accurately mask the coroguard... but I'll try it another way next time. This time around I tried about 10 different types of tape used in different ways but the results weren't that great. Have not tried the tape for curves though. I've got some so I'll give it a whirl. LH707, I like your idea of removing the fairings and putting them on after painting. I'm also currently building a Hasegawa DC-10 and the fairings are separate parts that I have intentionally left off the model until painting is complete (for this very reason). I like to use this product, myself. Wow! That looks like some magic juice! Is there a hobby shop in DFW that sells it?? I'll be there in a couple weeks! The flap track fairing mask stuff looks great. Is it out yet or do I have to wait till April to get it at my local shop? Seriously I'd use some of the stretchy vinyl tape and trim around it with a sharp X-acto knife. Confession time sometimes I just "ignore" the lower corogard and leave the lower wing all gray. Most of the time I'm the only one who knows. Good luck. Many options have been mentioned. are no issues with the Flying Color items. Glad to see Ahmed still has them. That's why I came up with the idea (you heard it here first) in the 1990s. I had people literally calling me up on the phone and laughing at me for making Corroguard decals. Stupidest idea they'd ever heard of. I need some of those freakin hot cakes. I am starting an Authentic Airliners MD-11, and need some coroguard for THAT particular model. Any suggestions? Jennings, can you make me a set?